Are you feeling refreshed and ready to start a new Home Organization Challenge? After yesterday’s challenge you should be feeling more energized and ready to take on just about anything. It’s amazing what a little pampering can do for your outlook, isn’t it? Today is all about running errands. We’re going to return items, drop off donation, grocery shopping, doctor’s appointments, and any place else that we need to go while we’re in our car. Then, when we’re all done we’re going to thank our car for it’s hard work by showing it a little love. 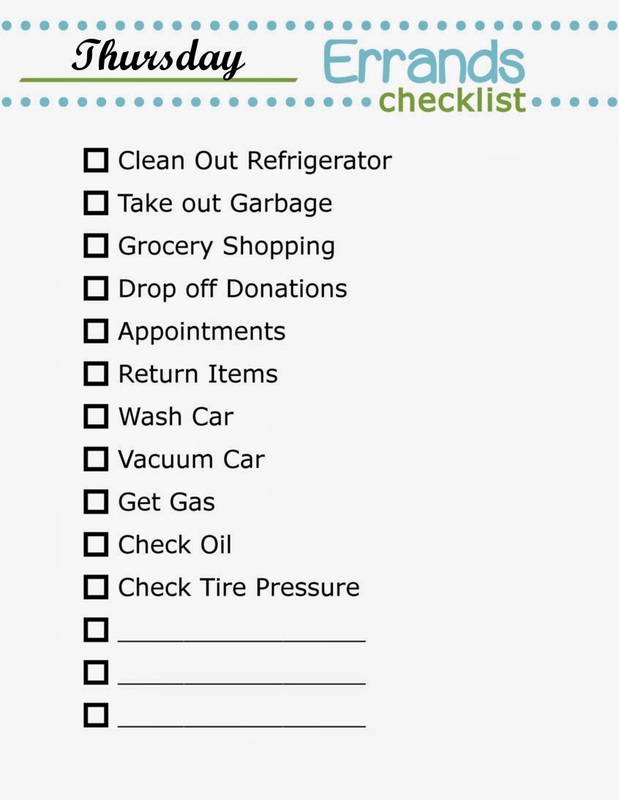 Doing all of your errands on one day not only saves you time but it can save you money and wear and tear on your car. Clean out the Refrigerator – I like to get rid of any leftovers that may be hanging around and do a quick wipe down before going grocery shopping. Also my garbage pick up is on Friday mornings so the garbage I threw out doesn’t sit around long before being picked up. Take out the garbage – I give this to the kids as a chore. Go Grocery Shopping – Since I have a clean and empty fridge, this is when I do my weekly grocery shopping. It is so nice to come home from shopping and be able to put things right into the fridge without having to fight for space. Drop Off Donations – Almost every week my 20/20 produces at least one small box of items to be donated. If you remember from the 20/20 challenge, when you fill the donate box it is to be immediately placed in your car. Since the box is already in my car I drop it off on my way to the grocery store, this saves me time and gas. Appointments – I schedule all of mine and my family’s appointments for Thursday (if possible). Having appointments always set on the same day of the week, makes it easier to remember. I like things to be simple. Return Items – If I have items that need to be returned I do it while I am out to save time and gas. Wash and Vacuum the car – Every week, she (the car) gets cleaned up – a bath, cleaning out the inside and vacuuming. I do this every week, whether she needs it or not, because it saves time and money. Fill up the Gas Tank – I like having a full tank of gas. A few years ago, my son got very sick in the middle of the night and we had to rush him to emergency. We started heading to the hospital when the gas light came on and because it was so late many of the gas stations were closed. We had to go out of our way to get gas, it could have ended up being a bad situation, but since then I always make sure to have gas. Check the oil – I check the oil and add any, if needed. I will also have the oil changed, if it is due. Check tire pressure – I carry a tire pressure gauge in my glove box. Every week I check the pressure in my tires, if they are low I will add air. It’s important to know the pressure of your tires and to keep them all at the same pressure. Doing this helps to extend the life of your tires which will save you money. It will also gives you better gas mileage which helps save money. After you print the Errand Day and you’ve added your activities, file it under the weekly tab in your Reminder Binder. I like to place the printable in a sheet protector so that I can use a dry erase marker to mark off the activities as they’ve been completed. At the end of the week you’ll decide which day of the week will be best for performing the activities.